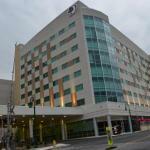 A downtown location combines an indoor pool and 24-hour room service from the on-site restaurant combine to make the non-smoking DoubleTree by Hilton Hotel a top choice in Reading. Guests savor the signature chocolate chip cookies upon checking in to the mid-rise DoubleTree. The non-smoking property houses 209 contemporary rooms each equipped with Wi-Fi 42-inch HDTVs and work desks. Rooms also supply mini-fridges coffeemakers and hairdryers. Head down to the on-site restaurant for a bite or mingle at the bar. Room service is also offered. Active guests hit the gym and cool off in the indoor pool and corporate types make use of the business center. Extras include a small convenience store laundry service and free parking. Pets are allowed for an additional charge. In downtown Reading the DoubleTree is across the street from the Santander Arena and a mile from Highway 422. The hotel is within a few blocks of shops and restaurants as well as the Santander Performing Arts Center. Guests can check out events at FirstEnergy Stadium three miles north or explore creativity at GoggleWorks Center for the Arts a mile away. To enjoy the outdoors drive 15 minutes south to the Nolde Forest Environmental Education Center. Philadelphia International Airport is 64 miles away.